Fr. Andrew Rogosh arrived in New York at Christmas of 1935 in order to establish an apostolate to serve the needs of the émigré Russian Catholics who had made their way to the New York metropolitan area after the tragic upheavals in their homeland. In the following months of 1936, he began the work of establishing a chapel. Soon thereafter, St. Michael’s Russian Catholic Chapel opened its doors at 266 Mulberry Street in Manhattan in order to serve their needs. It was not long before, World War II sent a new wave of Russian immigrants to New York. Fr. Rogosh was in position to help give them spiritual comfort, often travelling to the various processing camps for displaced persons to seek them out and help them get settled. The inherent beauty of the Russian liturgies and chant soon attracted many others, Russian and non-Russian, to the little building on Mulberry Street. Fr. Rogosh died on October 17, 1969 and for a period of nearly ten years the community of St. Michael’s was served by the Byzantine Rite Jesuits from the John XXIII Center at Fordham University. Among those who served at St. Michael’s during those years were Fr. Wilcock, Fr. John Geary, and Fr. Walter Ciszek, whose first visit to the chapel was on the day of his return to New York after his release from the USSR in 1963. From 1974, a new wave of Russian immigration came to New York. A few of these people decided to come to St. Michael’s. In 1979, Fr. Joseph Lombardi, S.J., a former parishioner of St. Michael’s and one of its many vocations, agreed to become the Administrator of the community. He was assisted in his work by Fr. 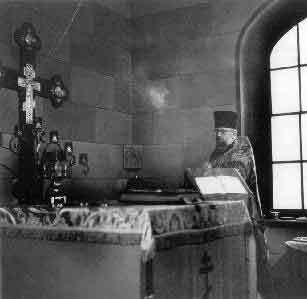 Roman Russo, a priest of the Melkite Eparchy of Newton well versed in the Russian Church. In 1988, the Oriental Congregation sent Fr. John Soles, a Russicum graduate who had been serving in the Russian Catholic parishes in Europe, to be the Rector of St. Michael’s. Soon after Fr. John’s arrival, the momentous end of the Cold War in 1989 and 1990 led to a wave of Russian immigration to the New York metropolitan area. The need for St. Michael’s and its apostolate continued. Upon Fr. John’s return to his native Spain, Fr. Economos Roman Russo became the rector, serving until his retirement 2016. After Fr. Roman’s retirement, Fr. Vladimir Sybirnyy, a priest of both Ukrainian and Russian heritage of the Eparchy of Stamford, was appointed rector by the Archdiocese of New York. For such a small church, it attracted the attention of well known persons, several of whom are candidates for canonization. The Servant of God Dorothy Day frequently attended Vespers or the Divine Liturgy with several of her fellow Catholic Workers. The Servant of God Catherine Doherty attended during her later days of living in New York City. She who went on to found Madonna House in Canada and wrote several practical works on prayer and spirituality which rely heavily on her Russian roots, including Poustina. Helen Izwolsky, the daughter of a Czarist diplomat, a Sorbonne graduate, and the author of many books and articles, attended St. Michael’s and was a friend of Dorothy Day and Catherine Doherty. On occasion during his younger years, Thomas Merton came to St. Michael’s to share in the Divine Liturgy with us. In 1986, St. Michael’s was honored by a visit from His Beatitude Patriarch Maximos V of Antioch, Alexandria and Jerusalem, the Patriarch of the Melkite Catholic Church. In addition to Patriarch Maximos, we have celebrated Pontifical Divine Liturgies on the occasion of the visits to St. Michael’s of Russian Catholic Bishop Andrei Katkov; Bishop Anarghyros Printesis, the Greek Catholic Exarch of Greece (1988); Bishop Louis Puscas, Romanian Catholic Bishop of the Eparchy of Canton (1988); and Bishop Basil Losten, Ukrainian Catholic Bishop of Stamford (in 1996 and again in 1997). Eugène Cardinal Tisserant visited St. Michael’s while on a trip to New York in the 1950’s. Duraisamy Simon Cardinal Lourdusamy visited St. Michael’s in 1987. John Cardinal O’Connor came to St. Michael’s in 1986 to take part in our fiftieth anniversary celebration. Edward Cardinal Egan visited St. Michael’s in 2009, when Fr. Deacon Christopher LiGreci was elevated to the rank of protodeacon. Bishop George D. Gallaro of the Eparchy of Piana degli Albanesi in Sicily celebrated the Divine Liturgy at St. Michael’s in July 2016. St. Michael’s has always attracted not only Russians seeking to maintain their spiritual roots while finding their way in American society, but also many non-Russians who were attracted to the richness and beauty of Russian spirituality. St. Michael’s has been compared to a mustard seed yielding great amounts of its fruit or to a small lump of leaven that raises the bread. Such a small community has produced a number of vocations out of all proportion to its size and circumstances. Nine priests, three deacons, and three readers, as well as several nuns have come from this humble community. We pray that we will be able to send many more workers into the Lord’s vineyard. We keep ever in mind that what makes our community, our parish, so special is not the small room in which we gather, but the people who come together there to pray, to worship, and to live their lives according to Christ’s greatest commandment, love.